This year's series focuses on kabuki dance plays based on noh themes and stories. We begin in November with a tale of a flesh-eating demoness; move on in February to one of the greatest tales of duty and heroism; and end in April with the foolish drunken antics of two servants. We will be screening full videos of live performances from the Shôchiku's Kabuki Meisakusen Series, which feature some of the greatest kabuki performers of the 20th and 21st centuries. The recordings have English language commentary, and we will also discuss important story and performance elements. And we will have green tea too! A dance play created in 1939 by Ichikawa En'ô I from the noh play of the same title (or called Adachigahara in some schools of noh). The story takes place on an autumn night on the moors of Adachigahara. A lonely woman named Iwate lives in this desolate place, and is visited by a group of travelling priests and their servant. She allows them to shelter with her for the night, but trouble ensues and she changes form into a flesh-eating demon. 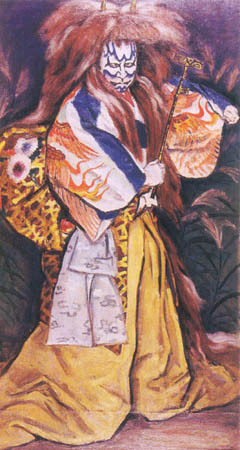 Image: Ichikawa En'ô I in the role of the demoness in Kurozuka. 1958 Oil painting by Hasegawa Noboru. A matsubamemono dance play based on the classic noh play Ataka,the story of Yoshitsune and his retainer Benkei trying to pass the barrier in disguise. 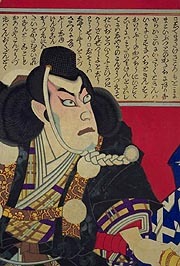 Kanjinchô is one of the most popular plays in the kabuki repertoire and is one of the "Kabuki Jûhachiban" - or great 18 plays of kabuki. Image: Ichikawa Danjûrô IX as Benkei in Kanjinchô at the Nakamura, January 1875. Print by Toyohara Kunichika. April Fools!! And the fools are two clever servants named Tarôkaja and Jirôkaja who manage to drink their master's sake, in spite of the fact he has tied them up. 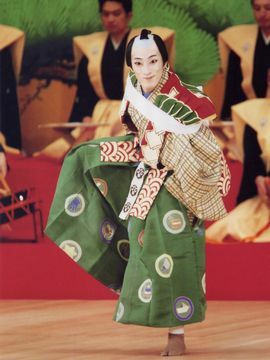 A popular matsubamemono dance-play based on the kyôgen comedy of the same name.